Crossrail to run further safety awareness events for cyclists - Crossrail . For information about the Elizabeth line please visit the Transport for London website. Crossrail and the Metropolitan Police Cycle Task Force are working together to raise awareness for safer cycling around construction traffic and sites. 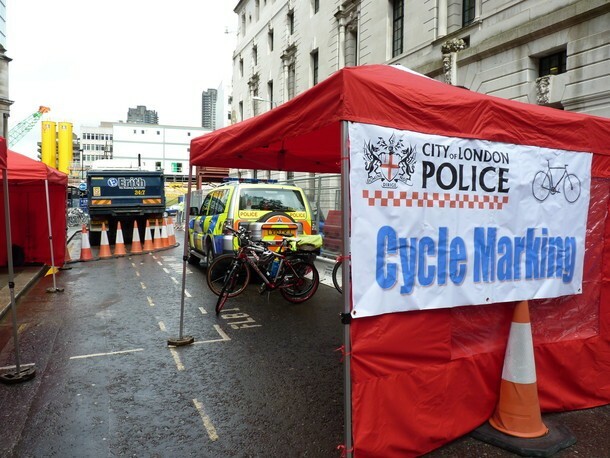 A pilot event was held successfully this summer at Finsbury Circus near Moorgate which attracted almost 40 cyclists. Visitors were given the opportunity to sit in the drivers seat of a large goods vehicle (LGV) to get a better understanding of what a lorry driver can and can’t see and where vehicle blind spots can exist. Feedback from the session was excellent with visitors saying that event increased their awareness of the issues when cycling near lorries. Following the success of the pilot event our cycle safety team will be running a series of further safety awareness events. The next pop-up safety event open to the public will be near our Bond Street worksite on Tuesday, 11th December between 7:30am and 10:30am at the corner of North Audley Street and Grosvenor Square, Mayfair. You will be able to security register your bike and have it safety checked for free as well as sit in the cab of a heavy goods vehicle. This event is kindly supported by Crossrail’s contractor Costain Skanksa Joint Venture. As part of our commitment to help educate young people about the importance of safety near construction sites, the team will also be visiting Swanlea School in Whitechapel. 200 year seven students will experience a lorry driver’s view of potential blind spots and understand the risks when cycling amongst construction traffic.